The inguinal canal is a short passage that extends inferiorly and medially through the inferior part of the abdominal wall. 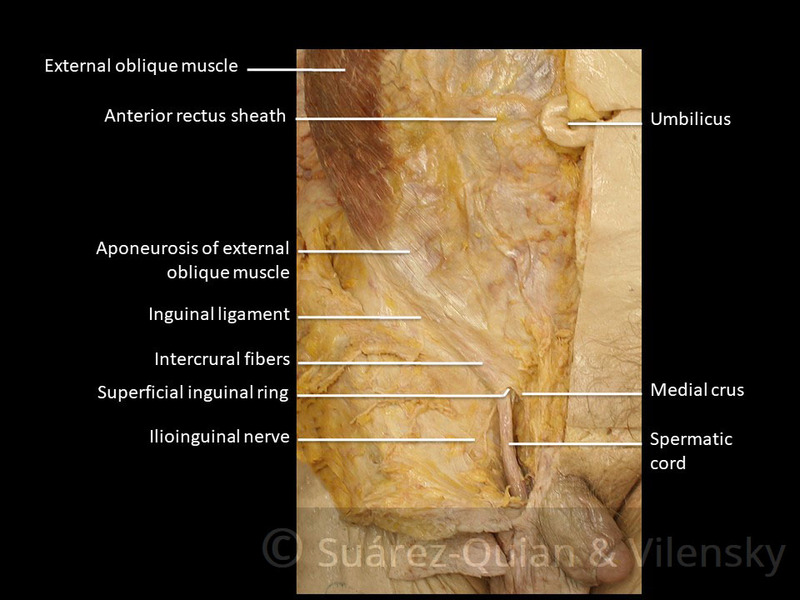 It is superior and parallel to the inguinal ligament. The canal serves as a pathway by which structures can pass from the abdominal wall to the external genitalia. It is of clinical importance as a potential weakness in the abdominal wall, and thus a common site of herniation. In this article, we shall look at the anatomy of the inguinal canal – its development, borders and contents. Fig 1 – Overview of the inguinal canal. Clinically it is important to note that the opening to the inguinal canal is located laterally to the inferior epigastric artery. During development, the tissue that will become gonads (either testes or ovaries) establish in the posterior abdominal wall, and descend through the abdominal cavity. A fibrous cord of tissue called the gubernaculum attaches the inferior portion of the gonad to the future scrotum or labia, and guides them during their descent. The inguinal canal is the pathway by which the testes (in an individual with an XY karyotype) leave the abdominal cavity and enter the scrotum. In the embryological stage, the canal is flanked by an out-pocketing of the peritoneum (processus vaginalis) and the abdominal musculature. The processus vaginalis normally degenerates, but a failure to do so can cause an indirect inguinal hernia, a hydrocele, or interfere with the descent of the testes. 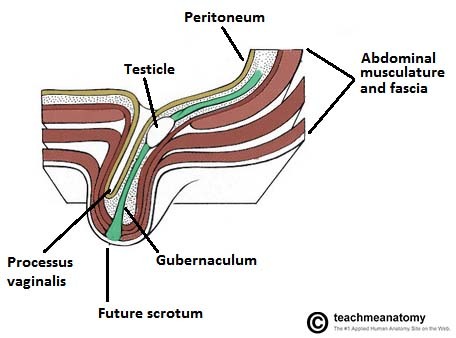 The gubernaculum (once it has shortened in the process of the descent of the testes) becomes a small scrotal ligament, tethering the testes to the scrotum and limiting their movement. Mid-inguinal point – halfway between the pubic symphysis and the anterior superior iliac spine. The femoral pulse can be palpated here. 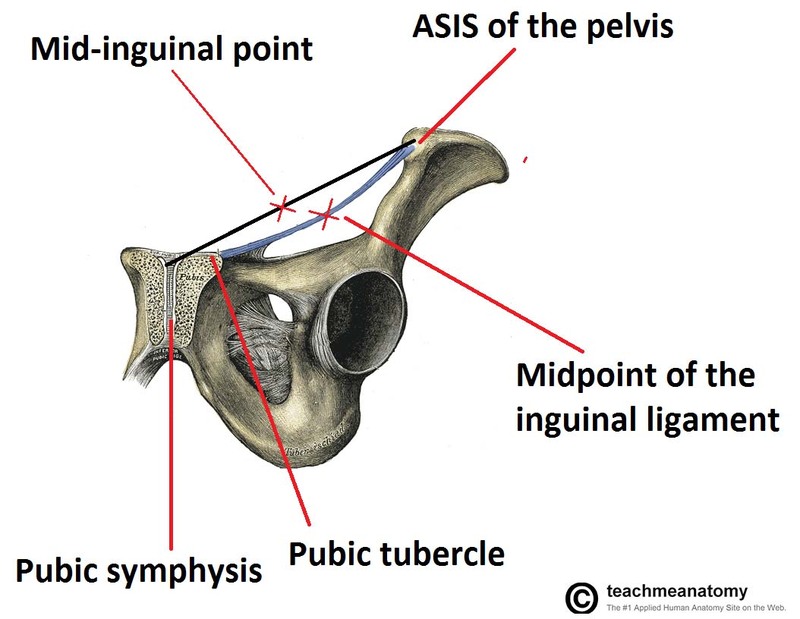 Midpoint of the inguinal ligament – halfway between the pubic tubercle and the anterior superior iliac spine (the two attachments of the inguinal ligament). The opening to the inguinal canal is located just above this point. The inguinal canal is bordered by anterior, posterior, superior (roof) and inferior (floor) walls. It has two openings – the superficial and deep rings. Anterior wall – aponeurosis of the external oblique, reinforced by the internal oblique muscle laterally. 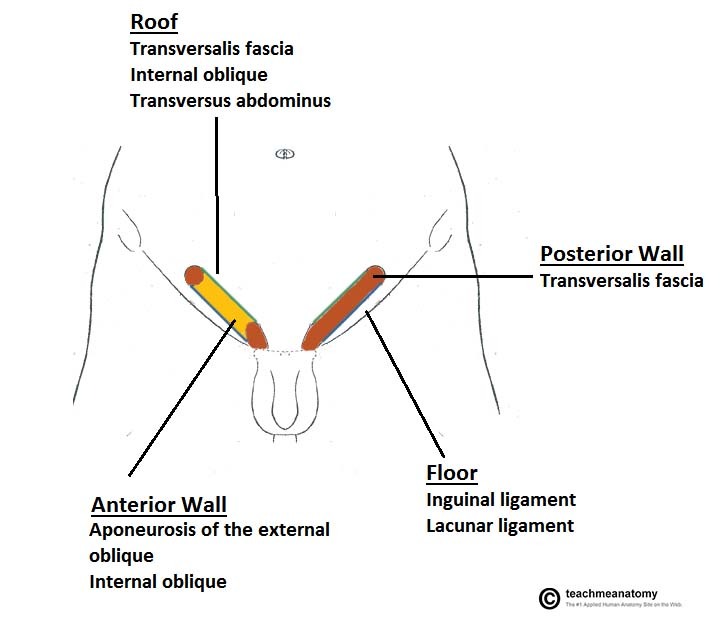 Posterior wall – transversalis fascia. 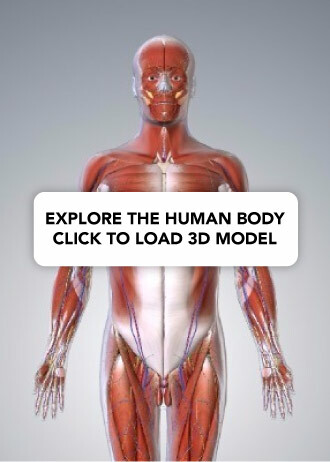 Roof – transversalis fascia, internal oblique, and transversus abdominis. Floor – inguinal ligament (a ‘rolled up’ portion of the external oblique aponeurosis), thickened medially by the lacunar ligament. During periods of increased intra-abdominal pressure, the abdominal viscera are pushed into the posterior wall of the inguinal canal. To prevent herniation of viscera into the canal, the muscles of the anterior and posterior wall contract, and ‘clamp down’ on the canal. Fig 4 – The borders of the inguinal canal. The anterior wall of the left inguinal canal has been removed. Fig 5 – Sagittal view of the inguinal canal, showing the borders. The two openings to the inguinal canal are known as rings. The deep (internal) ring is found above the midpoint of the inguinal ligament. which is lateral to the epigastric vessels. The ring is created by the transversalis fascia, which invaginates to form a covering of the contents of the inguinal canal. The superficial (external) ring marks the end of the inguinal canal, and lies just superior to the pubic tubercle. It is a triangle shaped opening, formed by the evagination of the external oblique, which forms another covering of the inguinal canal contents. This opening contains intercrural fibres, which run perpendicular to the aponeurosis of the external oblique and prevent the ring from widening. Spermatic cord (biological males only) – contains neurovascular and reproductive structures that supply and drain the testes. See here for more information. Round ligament (biological females only) – originates from the uterine horn and travels through the inguinal canal to attach at the labia majora. This is the nerve most at risk of damage during an inguinal hernia repair. 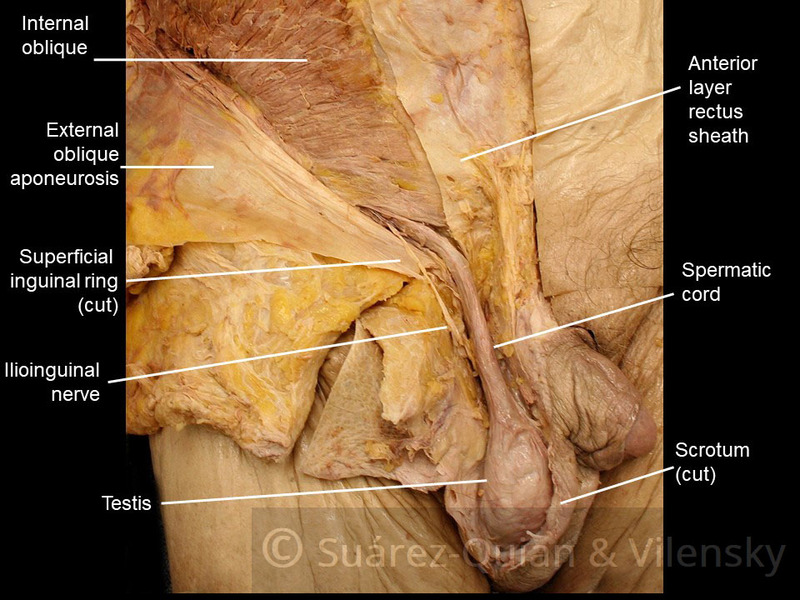 Genital branch of the genitofemoral nerve – supplies the cremaster muscle and anterior scrotal skin in males, and the skin of the mons pubis and labia majora in females. The walls of the inguinal canal are usually collapsed around their contents, preventing other structures from potentially entering the canal and becoming stuck. Indirect – where the peritoneal sac enters the inguinal canal through the deep inguinal ring. Direct – where the peritoneal sac enters the inguinal canal though the posterior wall of the inguinal canal. Both types of inguinal hernia can present as lumps in the scrotum or labia majora. Indirect inguinal hernias are the more common of the two types. They are caused by the failure of the processus vaginalis to regress. The peritoneal sac (and potentially loops of bowel) enters the inguinal canal via the deep inguinal ring. The degree to which the sac herniates depends on the amount of processus vaginalis still present. Large herniations are possible in which the peritoneal sac and its contents may traverse the entire inguinal canal, emerge through the superficial inguinal ring, and reach the scrotum. In contrast to the indirect hernia, direct inguinal hernias are acquired, usually in adulthood, due to weakening in the abdominal musculature. The peritoneal sac bulges into the inguinal canal via the posterior wall medial to the epigastric vessels and can enter the superficial inguinal ring. The sac is not covered with the coverings of the contents of the canal. Fig 6 – Transverse view of the inferior abdominal cavity. Compares normal anatomy with indirect and direct herniation. Prosection 1 – The superficial inguinal ring and contents of the inguinal canal. Prosection 2 – The spermatic cord and inguinal canal. An indirect inguinal hernia can result from which structure failing to regress after the descent of the testes? Which two of the following are the attachment sites for the inguinal ligament? Which of the following forms the posterior wall of the inguinal canal?